Ed Mancini and his late wife, Joan Mancini, were working at their driving range in northern Macomb County six years ago when they saw an old friend coming. What they didn’t see coming was an investment scam that fleeced them and two relatives out of $1.5 million. After enjoying early paybacks of 30 percent on their “investment,” the retired tire engineer and his wife lost every cent of $470,000 they gave a former car salesman they had known for 40 years, the 93-year-old Mancini said last week. “I’m not penniless, but I could’ve used that money — I could’ve gone to the French Riviera and stayed on the beach, you know?” the Harrison Township resident quipped with a chuckle. But he knows the issue of senior fraud is no laughing matter. That is why those in law enforcement want other seniors to know the dangers so that they don’t become victims themselves. Senior fraud is a broad category of thievery that authorities say is on the rise as the nation’s population ages and as technology gives a fresh edge to con artists. The Federal Trade Commission’s Consumer Sentinel database logged a 60 percent increase since 2008 in the number of people filing complaints, many from seniors, “but no one knows how much fraud is out there, and it’s unknowable because a lot of victims suffer in silence,” said Doug Shadel, a national expert on fraud for the AARP. Seniors’ financial losses to fraud have risen an estimated 6 percent a year for the past five years, according to a study by MetLife and the National Committee to Prevent Elder Abuse. Yet many cases go unreported because some seniors are embarrassed to acknowledge they were victimized, said Barbara McQuade, U.S. attorney for the Eastern District of Michigan. “I think seniors are more vulnerable than any time in history because the criminals don’t have to get into your home. They can come right in through your computer,” McQuade said. The con artist who stole Mancini’s money is in prison, serving 45 months to 20 years. Mancini said he still has a small pension, his house and the driving range, so he has put the painful loss behind him. Though Mancini was in his 80s when he and his wife were scammed, people of all ages can become victims. Still, seniors are often the targets, said Sandy Markwood, CEO of the National Association of Area Agencies on Aging. “Older people are often very trusting people — that’s from the era they grew up in — and they may be lonely,” so they are receptive to come-ons from a smiling face and a friendly voice, Markwood said. • Affinity frauds: These usually involve predators selling investments after gaining their victims’ trust by sharing an affiliation, such as religious, school or ethnic ties, club memberships or just friendship, such as the one Mancini had with the car salesman turned investment broker. Mancini was taken by a Ponzi scheme, in which shysters pay interest to initial investors from the proceeds of later victims. • Internet frauds: These utilize online means to reach mass audiences cheaply with misleading offers for everything from penny stocks to overseas travel to miracle cures. Retirees who are alone and use e-mail at home often don’t hear the cautions that others get from co-workers, classmates and co-workers about Internet scams. • Telephone scams: Generally arrive on landlines, so they most often reach older people who are home during the day. Callers use high-pressure tactics to sell fraudulent investments, insurance policies or travel deals; they make misleading charity pitches or execute a variety of swindles, including the infamous grandchild scam. 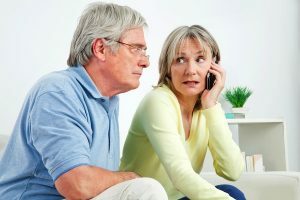 In that one, a caller purports to be one of the senior’s grandchildren or friend of the grandchild, desperate to get emergency cash for a phony mishap in a foreign country. Seniors have lost thousands of dollars to the scam, police said. • Mail fraud: These scams fool recipients with official-looking, highly personalized letters. Typical scams include fraudulent sweepstakes offers that ask “winners” to submit a fee before collecting winnings. “All these older people are on limited incomes, and when they hear they’ve won money, they get excited,” said Sharon McBride of Troy, whose elderly parents in Sterling Heights received several phony sweepstakes offers, asking them to “send money to pay the taxes” before they can claim their prize. • Face to face: This can occur on a victim’s doorstep, where con artists try to sell phony home services or gain entrance to a victim’s home by posing as utility workers. One person may distract the resident while an accomplice steals valuables. In some instances, the culprits already have access inside the home, such as an unscrupulous caregiver or relatives. In one case of face-to-face fraud, an employee at Autumn Woods Residential Health Care in Warren was arrested March 24 and charged with stealing a 71-year-old resident’s credit card information and making unauthorized purchases totaling $1,334.66, the Michigan attorney general’s office said. Sometimes, the con artists’ approach is veiled, as with identity theft. Take William Paulson, 67, who has cut hair in his Center Line shop for 40 years and never encountered fraud. But since his identity was stolen a year ago, Paulson said con artists have repeatedly tried to steal his money. Each time, he was notified by authorities, and Paulson prevented losses to his bank accounts. Recently, the Internal Revenue Service sent him a letter saying that his 2013 tax return lacked some details. “But I hadn’t even had my accountant start my taxes,” Paulson said. Someone had filed an income tax return using his ID in order to get Paulson’s tax refund. Paulson promptly called the IRS and then filed his taxes along with a form explaining the ID theft. “They tell me it’ll be four to six months now before I get my refund,” Paulson said. In federal court in Detroit, a Clinton Township man pleaded guilty to receiving nearly $1 million in IRS refunds after filing fake returns, some in the names of dead people; and two Detroiters were sentenced last week for bilking the IRS out of more than $1 million from bogus tax returns, federal prosecutors said. Mancini’s daughter Sandy Boone, 56, of Sterling Heights said she can’t forget the day that con man Brian Marsack confessed to her that he had lost everything her father and other family members invested, then wept and begged her not to call police, she said. “He said he knew another old man he could take, and if we just gave him a little time, he’d get money from him to give to us,” Boone recalled. “I said, ‘Do what you can do,’ but as soon as he left, I called the police,” she said. Although Marsack had not needed the Internet to cheat investors, technology played a role because he used a color printer to create impressive financial statements complete with the logos of familiar investment banks, Boone said. These days, Marsack’s 2012 sentencing is just a memory, but Mancini has reminders of how his lifestyle changed after he was swindled. He looks after an elderly sister-in-law, who moved in with him after she lost $550,000 to the same scheme. Sitting in his house, unused, is a 52-inch TV that the swindler gave as a bonus for extracting a $100,000 check from Mancini’s late wife, the widower said. “But it uses electricity like crazy, so I got a smaller TV. I couldn’t afford the electric bill on the big one,” he said.